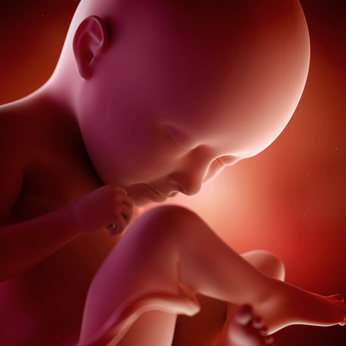 Find out what's happening with your baby and your body during the third trimester of pregnancy. Your baby is the size of a cucumber, about 2.5 pounds and almost 16 inches long. 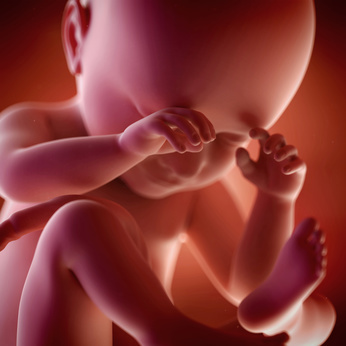 Your little one is settling into the proper position for birth, with their head facing downward. They're busy these days blinking, coughing, more intense sucking, hiccupping and, perhaps most important, better breathing. Your baby may as well be dreaming as brain wave activity measurements indicates different sleep cycles, including the rapid eye movement phase, the stage when dreaming occurs. Your baby is the size of a head of cauliflower, weighs nearly three pounds now and measures about 17 inches. 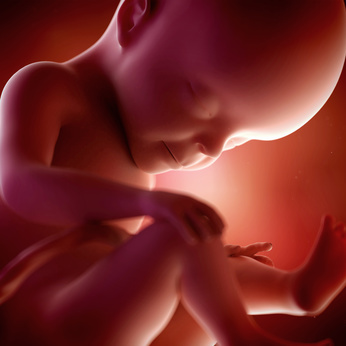 In fact, over the next 11 Weeks, baby will double or even triple her or his weight. As more fat is deposited under the skin surface, her wrinkled skin is smoothing out. Also, the buds of your baby’s future permanent teeth begin to form in her or his gums now. Baby’s adrenal glands begin producing the hormones androgen and oestrogen, which stimulate the mother body’s milk production. Your baby is the size of a cabbage he/she is now weighing in at over three pounds. Until now, the surface of your baby's brain was smooth but now it begins to wrinkle (the wrinkles are called convolutions) so that it can hold more brain cells. Now that baby’s brain and new fat cells are regulating his body temperature, the lanugo, the hair covering your baby's body is beginning to disappear. Your baby's bone marrow has taken over production of red blood cells and now he or she will be more able to thrive on his or her own once born. Your baby is about as long as a bunch of leeks, weighing in at three-plus pounds and measuring 18 inches long, they are quickly approaching their birth length. The brain is working overtime developing faster than ever and making connections between individual nerve cells at a super-fast rate. 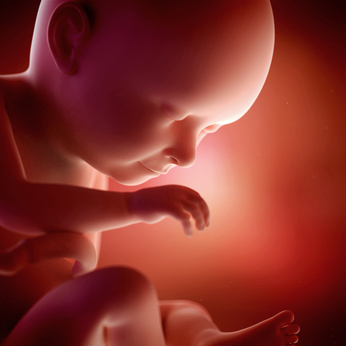 Your baby is now processing information, tracking light and perceiving signals from all five senses. Of course he or she can't smell anything right now, but that's only because they're still submerged in amniotic fluid and need to be breathing air to get a whiff of anything. Your baby is almost four pounds and just about 19 inches. 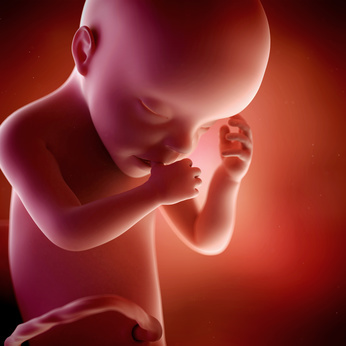 In these past few weeks all of your baby’s major organs are fully developed, except for the lungs. These days it's all about practicing all the survival skills: swallowing, breathing, kicking and sucking. Anticipating mouth feeding, your baby’s digestive system is all formed. The skin is becoming less transparent and more opaque as more and more fat accumulates under the skin. There’s a chance baby has settled into the head-down, bottoms-up position in preparation for birth although some babies still turn around at this stage. Baby may be anywhere between 17 to 19 inches in length and could grow up to another full inch this week. He or she weighs more than four and a half pounds and is still gaining weight, about half a pound a week. The amniotic-fluid level has reached maximum by now, making it likely you have more baby than fluid. Baby’s got her/his own immune system. Antibodies are being passed from you to your little one as he or she continues to develop the immune system, which will help the baby fight off all sorts of germs outside the womb. Your baby is the size of a honeydew, he or she weighs five pounds and could be as tall as 20 inches. If your baby is a boy, then you will be pleased to know that this week his testicles are making their way down from his abdomen to his scrotum. In other baby-related developments, the fingernails have probably reached the tips of the fingers by now. Braxton-Hicks contractions can be felt from early on in your pregnancy. If these irregular, painless contractions increase later in your pregnancy they are also considered to be false labour rather than real labour. About the size of a honeydew melon, your baby is now over 18 inches long and is approximately 5 1/4 pounds. 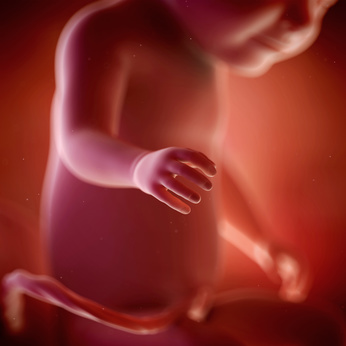 Baby's kidneys are fully developed now, and the liver can process waste products. Most of their basic physical developments are now complete and she/he will spend the next few Weeks putting on weight. Fortunately the baby's skull remains soft. And for good reason: it will allow your baby to squeeze more easily through the birth canal. With less space in uterus now, the baby movements have shifted from kicks and punches to rolls and wiggles. Baby is now about six pounds and 20 inches long. Growth will experience a slowdown now. Baby's skull isn't the only soft structure in his or her little body. Most of your baby's bones and cartilage are quite soft as well. Many of your baby's systems are pretty mature, at least in baby terms and just about ready for life on the outside. Blood circulation, for instance, has been perfected and your baby's immune system has matured enough to protect him or her from infections outside the womb. Other systems, however, still need a few finishing touches. Baby is the size of a large cantaloupe, he or she weighs about 6.5 pounds. Right now, your baby is busy rehearsing for his big meeting, simulating breathing by inhaling and exhaling amniotic fluid, sucking on his or her thumb, blinking and pivoting from side to side. Your baby's head will at birth, be the same size circumference as his or her hips, abdomen and shoulders. Baby is running out of room in the uterus, so he or she mostly stretches and wiggles, instead kicking. Baby is the size of a winter melon, weighing almost seven pounds and measuring nearly 21 inches long. Only a few more weeks before your baby makes steps into your world. Your baby’s lungs have strengthened and his vocal chords have developed, which means he’s ready to communicate through wails and cries. The lungs will continue to mature and produce surfactant, a substance that prevents the air sacs in their lungs from sticking to one another once they start to breathe. Your baby now weighs almost as much as a watermelon. He or she weighs around seven to eight pounds and measures 19 to 21 inches. At this point, baby has shed most of that white substance called vernix and the fine hair called lanugo that has covered their skin. Now, his or her skin has finally changed from pink to white thanks to a thicker fat layer that has been deposited over the blood vessels. While the body isn’t growing as much, the brain is, it’s already 30 percent bigger than it was just 4 Weeks ago. Now the size of a watermelon, your baby weighs anywhere from six to nine pounds and measures between 19 and 22 inches. 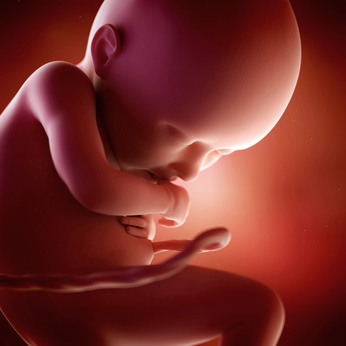 The placenta is still providing the antibodies that he or she will need to fight off infections for the first six months of their life. Your baby’s major organs are ready for primetime and she/he will be letting you know soon when they are ready to meet you. Baby’s vision at birth is a bit blurry since she or he is only able to focus about an inch away, instead your baby will instantly recognise the sound of your voice and your partner’s. Most women have the 40th week as their “due date” but normal pregnancy actually lasts up to 42 weeks. 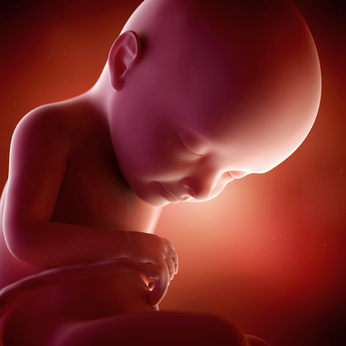 Your baby is not considered overdue until 42 weeks of pregnancy. 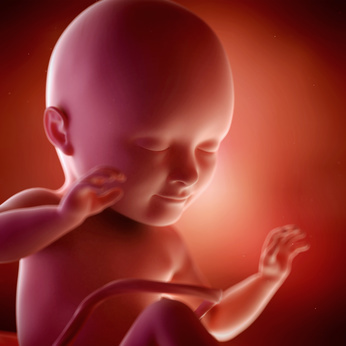 Only 5 percent of babies arrive on their due date, the rest enter into their tenth month uterine life. During childbirth, your baby will produce more stress hormones than any other time in his or her life. 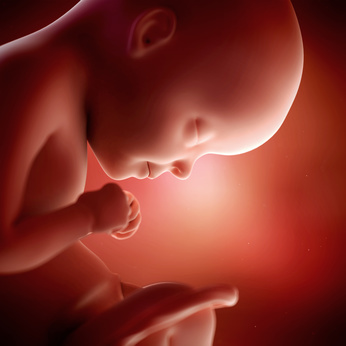 These hormones will help your baby to adjust to life outside the womb and help all those survival instincts to kick in. Also, first breath requires considerably more effort because the tiny air sacs in the lungs need to be inflated for the first time so that they expand to fully to start breathing. When the baby is ready to meet you, chances are the skin will be dry, cracked, peeling or wrinkled due the protective vernix that was shed weeks ago in anticipation of birth. 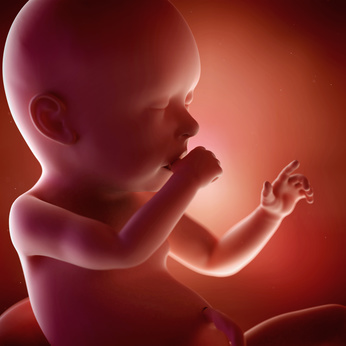 A baby born at 42 weeks will also have longer nails, possibly longer hair and little or none of that lanugo. 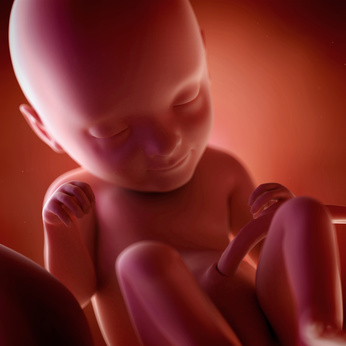 In some cases, your placenta is less efficient at this stage and so options for inducing labour will be discussed with you. If you choose to continue and await natural labour, then you may be offered additional monitoring to keep a closer eye in things.